Sir John Constable / David Lucas mezzotint "Summer Evening"
This beautiful mezzotint engraving was composed by John Constable and engraved by David Lucas from the "English Landscape" series. This impression on laid paper is from the 1831 edition. Image size is 5 1/2 x 8 1/2 inches (140 x 217mm). Summer Evening is considered one of the finer plates from this series. Condition: There is some creasing and foxing, and the sheet has been trimmed by a previous owner, leaving narrow margins. All in all, an excellent value for this rare early impression of one of Constable's masterpieces. 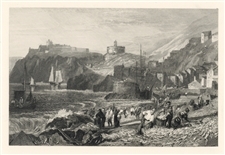 Sir John Constable / David Lucas mezzotint "Hadleigh Castle"
This beautiful mezzotint engraving was composed by John Constable and engraved by David Lucas. 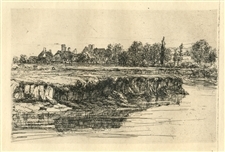 It is from the much sought-after "English Landscape" series; this impression on cream wove paper is from the Bohn edition of 1855. 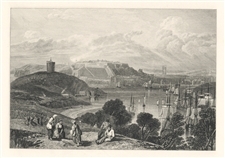 Image size (not including the platemark) is 6 x 9 inches. 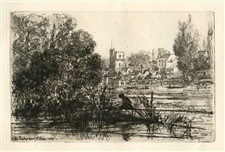 Constable and Lucas collaborated very closely in the making of these prints-- in fact, Lucas was known as "Constable's Engraver", as the great painter would work with no other. Hadleigh Castle is considered on of Constable's finest works. Condition: there is foxing to the margins (see second photo). 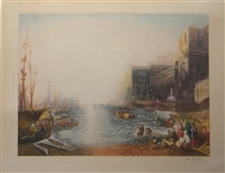 John Postle Heseltine original etching "Venice from the Lido"
Medium: original etching. This impression on cream laid paper was printed by Lienard and published in Paris by L'Art in 1879. The plate size is 7 3/4 x 11 3/4 inches (200 x 300 mm). Signed in the plate, not by hand. 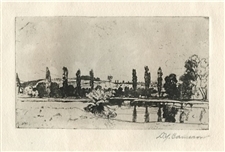 John Postle Heseltine original etching "Le pont de Waterloo a Londres"
Medium: original etching. 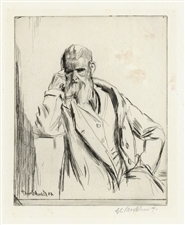 This impression on cream wove paper was published in Paris in 1897 by Gazette des Beaux Arts. The plate size is 5 x 9 inches (125 x 227 mm). Signed in the plate by John Postle Heseltine, not hand-signed. Condition: there is foxing in the margins, not affecting the etching. 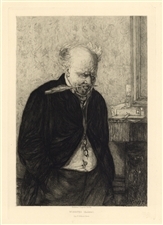 Medium: etching. 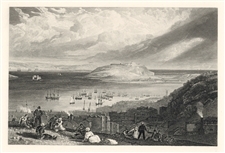 Etched by Leon Richeton after the Erskine Nicol painting. 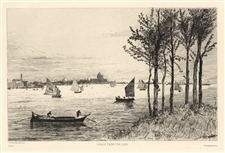 A splendidly rich impression printed in Paris in 1877 by F. Delarue on cream laid paper. Plate size: 11 3/4 x 8 3/8 inches (300 x 207 mm). Not signed.